Writers have favorite characters (sh—don’t tell the others!). Every once in a while one truly leaps off the page and refuses to let you go. Take my Lady Emily or Vaughn Everard; they would not rest until their story was told. As their author, you can only hope others will react to them the same way. 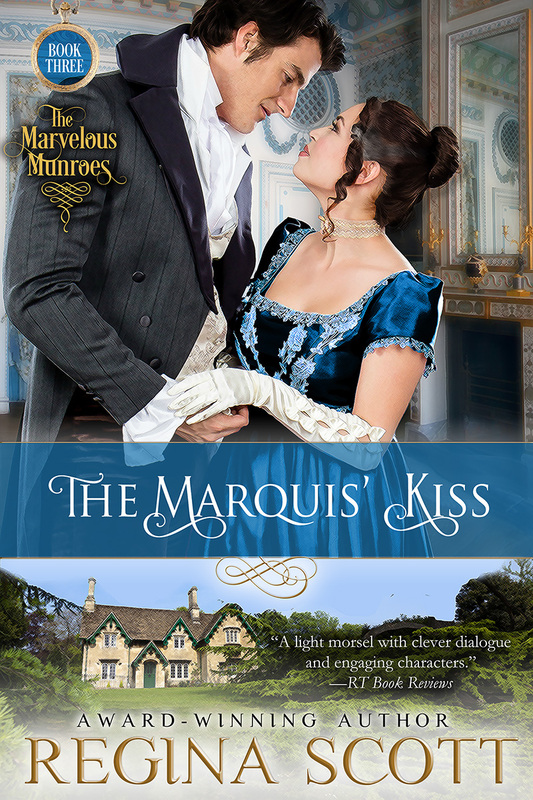 Another such heroine is Margaret Munroe in The Marquis’ Kiss. She was one of my earlier heroines, back in the days when I often based my heroines on women I knew. I have told you about Hannah Alexander of Secrets and Sensibilities being based on my late dear friend, Nancy. Margaret is also based on a friend. With her verve, vim, and vigor, I thought she would make a marvelous Regency lass. I asked her permission first, of course, and when Kiss was first published, she accused me of peeking in her windows the characterization was so spot on. But many people struggled with Margaret, including the Art Department at Kensington, where the book was first published. You see, she is prematurely turning gray, and gray-haired heroines were not in vogue. But my friend had strands of gray hair when I met her at a summer camp when she was seventeen and I was nineteen. I was very glad when the first cover showed a young lady in the moonlight. I like to pretend the silver in her hair is from more than the moon. Margaret is also open-hearted, giving of herself to everyone she meets, from a royal duke to a reformed prostitute. Some people thought she should have been more attuned to the class system of Regency England. I never questioned that. Margaret knew it was there. She simply refused to abide by it, and she was ready to take the consequences. Finally, Margaret is honest, to the point of embarrassment. She says what she thinks, with very little filter. Reviewers commented that she couldn’t possibly behave that way. One went so far as to say that no human being ever born behaved like Margaret Munroe. Shall I introduce you? Here’s a taste. The marquis was already sitting properly on one of the arm chairs when she arrived. He was probably the only person in the world who could look comfortable and in command on the stiff furniture. He was arrayed in a splendid coat of camel-colored superfine and tan chamois trousers tucked into gleaming Hessians. He rose as she entered, and she did not think it was her imagination that he looked relieved to see her. She wondered what her stepmother had been saying to him. Mrs. Munroe was glowing possessively. Margaret and the marquis had no more than greeted each other and seated themselves before Mrs. Munroe made the flimsiest of excuses and quit the room with a knowing glance at Margaret. She was giving the marquis a moment to propose. The idea was so ludicrous that Margaret’s nervousness evaporated in amusement. She thought his shoulders sagged in his relief and wondered suddenly whether there was more to the story of Lady Janice’s refusal than she had thought. If he did stay in her life long enough, she might have to have a talk with the lady. Surely Lady Janice would tell her the truth of the matter. “You are very good at being forthright,” he said to the window. “Painfully so,” she acknowledged cheerfully. “And I do expect the same of others. So, out with it, my lord. You are only here to prove to Society that you were not trifling with my affections. Let us have a decent conversation and set you free from this onerous duty.” She knew the words sounded like a challenge and steeled herself for his concurrence. He stiffened as if making some resolution then strode back to her side. Sitting beside her on the sofa, he took her hands in his. Margaret looked up in surprise at the intensity of his gaze. “Really?” she squeaked, then swallowed the astonishment and pleasure that was preventing coherent thought, much less speech. “Really,” he said with a smile that lit his eyes with blue flame, like brandy around a plum pudding. It both warmed and thrilled her. She could only nod, overcome by the tumult of emotions. A friendship was more than she had thought possible, yet how insipid it seemed. Her cousin Allison had inspired an offer of marriage after only a few encounters, and the best Margaret could do was a friendship? The second-rate Munroes were a dismal second this time. Yet even as she sighed, she felt a tingle of hope. Stranger things than friendship had led to romance. I am very happy that Margaret’s story is available once more. I hope you find it does her justice. But I’m not sure I’ll ever be a good enough writer for that. I like Margaret a lot. I'm not crazy about Thomas but I think she is good for him and will help him lighten up a bit.